For starters, bitcoins are stored in a bitcoin wallet, which is an online wallet installed on your computer, mobile phone or secure cloud environments. The wallet is a free and open-source software program that will generate your first and subsequent bitcoin addresses. Whenever a new bitcoin address is generated, a cryptographic key pair of a public key and a private key is created. This key pair is necessary to identify the bitcoin and perform a transaction. This means that bitcoin is not only a token of monetary value but also a method for transferring the value. The public key, commonly referred to as the address, serves as the bitcoin address to receive bitcoin and to check on your bitcoin balance. The public key is shared with others, such as friends and merchants, to complete bitcoin transactions and transfers. The private key is uniquely matched with the public address and is a proof of ownership of a bitcoin address. The private key must be kept confidential as it is used to sign transactions and prevents transaction from being altered once it is issued. If the private key is lost or disclosed, you may lose access to your bitcoin. Once you have acquired bitcoins and have created a bitcoin address, you can then use them for online transactions. All bitcoin transactions are stored publicly on the bitcoin network, which means that the balance and transactions of any bitcoin address are available and visible to the online community. Bitcoin is no longer obscure or seen purely as an investment, as bitcoin owners can now spend it in exchange for goods and services. 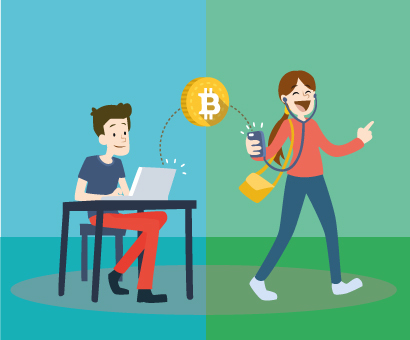 While it was difficult to find a merchant accepting bitcoin in the past, the rising amount of merchants accepting bitcoin has given bitcoin owners growing options to spend their digital currency. Even retail giants with billions in revenue have decided to add bitcoin as a valid method of payment. Online e-commerce businesses, big and small, are the forefront of merchants who accept bitcoin transactions. However, the number of physical stores accepting bitcoin is also increasing. From bars and restaurants to hotels and gaming sites, bitcoin is fast becoming a widely accepted currency around the world.